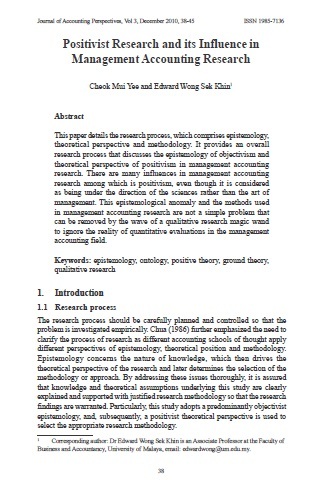 This paper details the research process, which comprises epistemology, theoretical perspective and methodology. It provides an overall research process that discusses the epistemology of objectivism and theoretical perspective of positivism in management accounting research. There are many influences in management accounting research among which is positivism, even though it is considered as being under the direction of the sciences rather than the art of management. This epistemological anomaly and the methods used in management accounting research are not a simple problem that can be removed by the wave of a qualitative research magic wand to ignore the reality of quantitative evaluations in the management accounting field. YEE, Cheok Mui; KHIN, Edward Wong Sek. Positivist Research and its Influence in Management Accounting Research. Asian Journal of Accounting Perspectives, [S.l. ], v. 3, n. 1, p. 38-45, dec. 2010. ISSN 0128-0384. Available at: <https://ajap.um.edu.my/article/view/3653>. Date accessed: 20 apr. 2019.